Guam is a territory of the United States in the western Pacific Ocean. When the Americans arrived on Guam in 1899 they brought a supply of United States stamps overprinted “GUAM.” These stamps were used for about one year after which regular U.S. postage stamps were used. 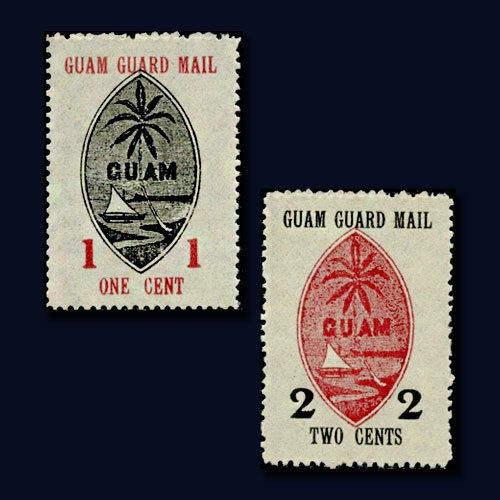 Thus, the first stamps of the “Guam Post” are Guam Guard Mail stamps which are shown above. On July 10, 1930, two stamps were issued with the denomination of 1-cent and 2-cents. These bi-color black and red stamps depict the Guam coat of arms in the centre. They are hand-stamped with “GUAM GUARD MAIL” on the top and the denomination both in letters and numeral at the bottom.